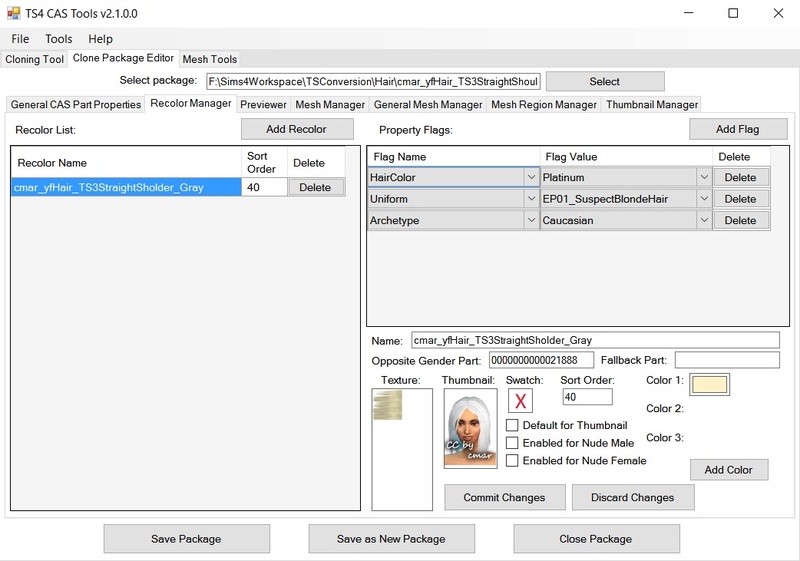 This is a full-purpose tool for creating CAS custom content for TS4. It's specifically meant to work with Milkshape 3D and to get around the limitations of using MS3D for Sims 4 meshes, but many of the functions can be done with OBJ files which can be used by almost any meshing program. In addition, if you click the Tools menu and Enable Special Tools, you'll see an additional Special Tools tab with various functions I've found useful for searching game packages. This tool is in a perpetual state of beta, so check back for updates, fixes, new features, and so on. Questions, bug reports, problems, and suggestions for the tool itself should be posted here. Questions and problems concerning a specific project should be posted in the TS4 Create / CAS Parts forum. If you're having problems, please upload the package, mesh, texture, etc you're working with and explain exactly what you did step by step. 'I tried to import something and it didn't work' doesn't help me to help you. 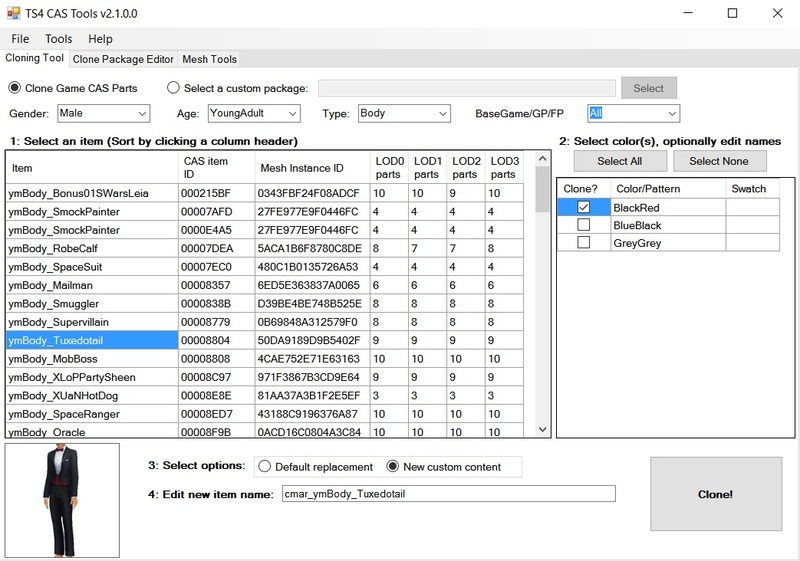 s4pe/s4pi is used by CAS Tools for package and image handling. s4pi/s4pe and CAS Tools are open source. 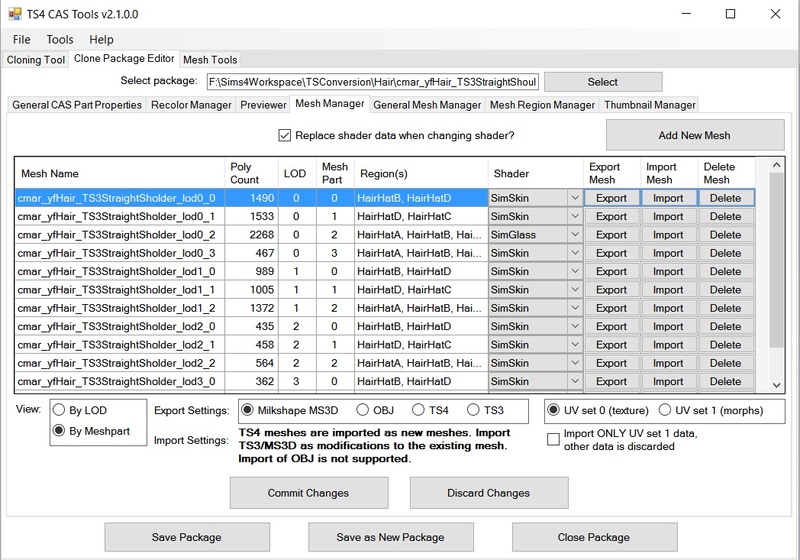 Fixed bug causing hex value error when auto-converting TS3 meshes with no reference mesh. Fixed bug causing auto-conversion of .ms3d meshes with no skeleton to error out. Exported DDS textures will now retain mipmaps. Ability to view body morphs added to the CAS previewer. Updated for the new version of the CASP resource in the 12/1/16 patch. EA hates me. Updated for the new version of the CASP resource in the 1/12/17 patch. Support for new occult body part types added. All meshes converted to ms3d should now have the correct skeleton. Updated for the new version of the GEOM (mesh) resource in the 11/8/17 patch. Will fix arm positioning in CC that now has the arms too close to or inside the body. 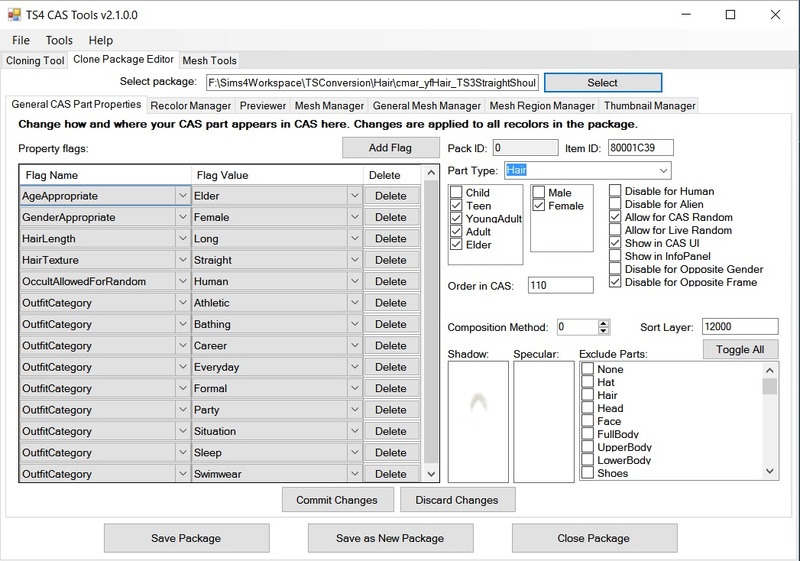 Open the package in CAS Tools and save as a new, fixed package. 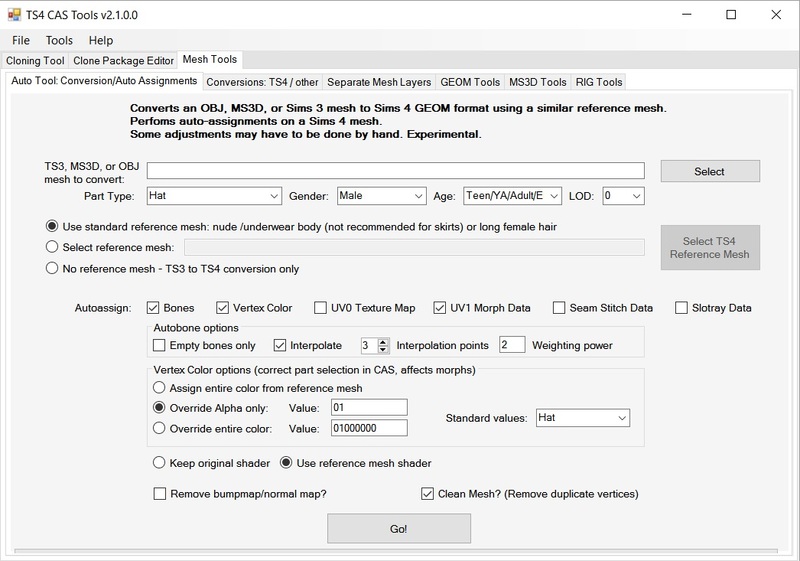 Additional option in mesh autoconversion to improve results with Milkshape head meshes by retaining the original vertex numbering. Additional option in mesh autoconversion to force manually entered UV1 coordinates. PLEASE NOTE: This is an interim release to deal with the November patch, but I haven't tested everything. Please report problems. When reporting a problem please be as detailed as possible and if relevant upload the package, mesh, image, etc you're getting an error with. This version is a fix only and should not be used for making cat and dog CAS Parts. I'm going to see if I can do a small standalone tool to batch convert CC clothing to fix the arms. Fixed failure to read textures from Cats & Dogs (and probably other packs). Added a fix for distortion of dress and skirt meshes in morphs, most visible in the fat morph. (Note for CC creators, the maximum red value for vertex color seems to now be 63. According to my tests values over that are causing distortion.) This fix, along with the arm position fix, is in the Clone Package Editor / Mesh Properties and Fixers tab. 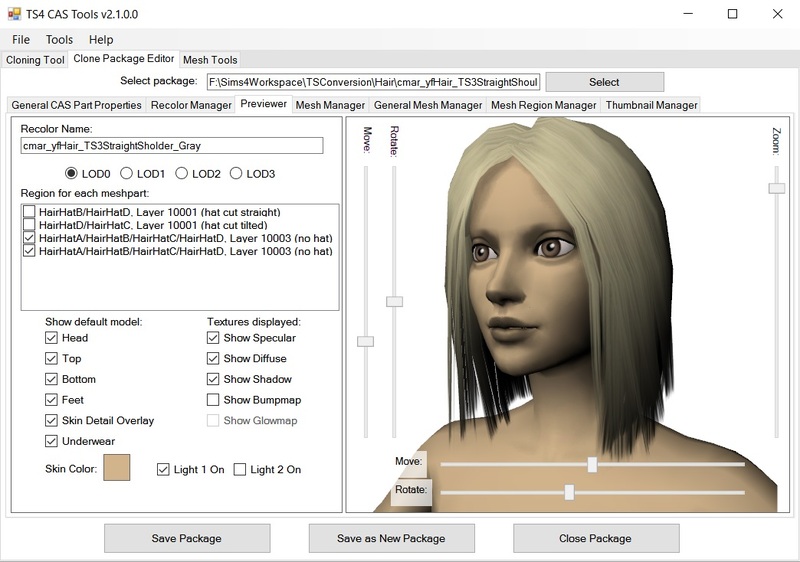 Added a fix for transparency (SimGlass) hair which may look either very darkened or have a hard, bright shine. (Note for creators - this is caused by linking a bumpmap that doesn't exist or not linking a bumpmap in the shader at all respectively. I guess the new version rendering is less forgiving.) This fix is also in the Clone Package Editor / Mesh Properties and Fixers tab. It does the same thing as blanking the bumpmap but is done in one click. Should only be used on hairs with these problems. I've heard there may be problems with color in other hairs but without a sample package and a picture of what the hair is supposed to look like I can't test. Fixed the vertex color correction in the same tab to maybe actually work. Updated vertex color standards. Fixed bug causing an unrecognized property tag to prevent saving changes to a CASP. Fixed incorrect values of Exclude Modifiers option in CASP general properties. Updated list of CASP property tags for Seasons patch. Updated CASP property tags and packs list for Get Famous and patches.